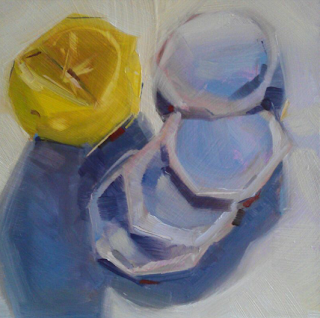 Today's poem takes its inspiration from Wes Martin's Daily Painting "Lemon & Grey" which is shown in the photograph below. (http://awmartist.blogspot.co.uk/2013/05/lemon-and-grey-daily-painting-131.html) I tried to give this poem as much structure as I could, matching the number of syllables in each line. More persperation than inspiration, though tea is VERY close to my heart. The tomb kitchen with its humming fridge. Dust worlds in the air. A bee-busy world feasts “Out There”. For pushing quiet a wild despair. And a cold pipe’s rattle. For Salvation Cake on days so bleak? A kettle of dancing water seek.